My friends Geremias and Antonio serve on the staff of Agua Viva El Salvador. These guys along with the rest of the staff host teams that come to drill water wells in impoverished communities. Geremias and Antonio were assigned to lead our Kingsland team in drilling a water well last week for the people of Los Robles, a small village nestled in the hills not far from the Pacific Ocean. A few days ago, Geremias emailed me a few photos that he took during our time in Los Robles. I was especially moved by the photos of the children. In one photo, a young boy named Julio is holding a New Testament given to him by Marina, a hygiene specialist with Agua Viva. 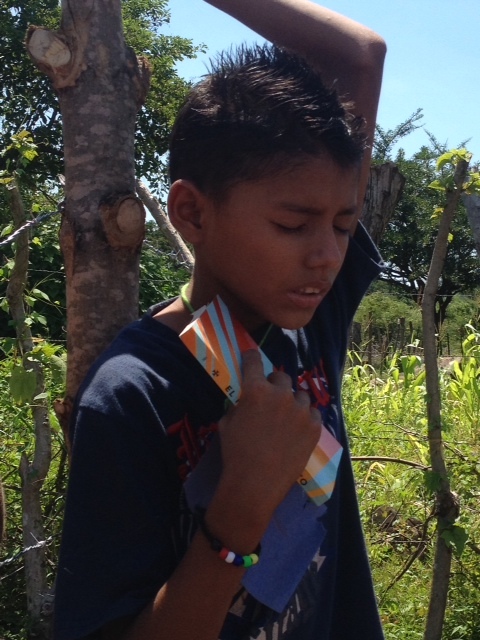 You can see the intensity in Julio’s face as he prays to invite Jesus to live in his heart. He was one of sixteen people who professed faith in Christ that week. 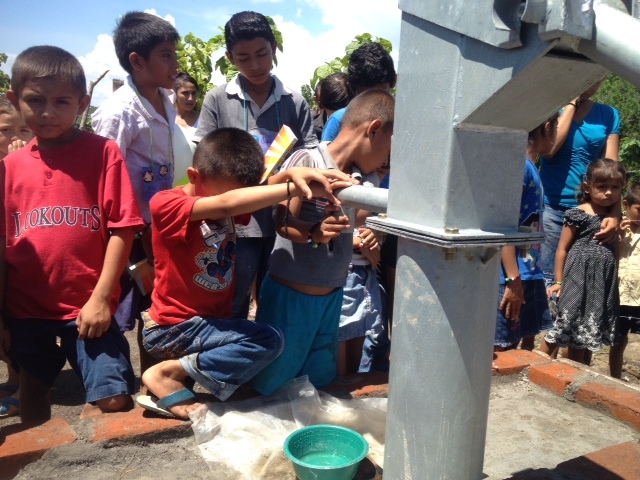 In another of my favorite photos, a group of children are assembled around their new water-well. Again, you can see the intensity as these children placed their hands on the pump and expressed their gratitude to God for their new water-well. They know what this clean source of water will mean to their families and how much time it will save them. Because I grew up with an abundant supply of running water in my home, I never once prayed at the faucet or stopped to give thanks for water. I just took it for granted. 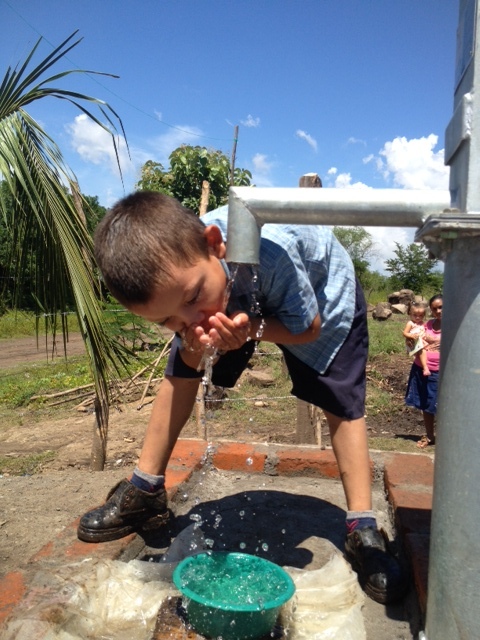 In another photo that Geremias sent me, a little boy is bending over and drinking the fresh, cool water that our team provided. He was sincerely grateful and drank with enthusiasm. I can’t remember the last time I was actually excited about drinking water. In fact, I don’t drink enough water — and the thought of drinking more water than I do sends me reaching for a Diet Coke instead. But for those who have limited access to water, there is nothing better or more refreshing than two cupped hands filled with clean water. I’m glad that Geremias sent me the photos of the kids. They remind me of how blessed I am to live in a place where water is at the very bottom of my list of concerns. These photos also remind me that what is at the bottom of my list is at the top of the list for 844 million people on the planet who lack access to clean and safe water. I’m glad that we will return to Central America three more times in the coming year to provide the poor with water and the Word. Loved this! Pictures welled tears in my eyes and made my heart full. Praise God from whom all blessings flow! It reminds me of so much Scripture that ties to the River of Life and who that Living Water is and promises!!! Our Lord Jesus is so good. He does indeed see, El Roi!!! I know somebody that wants to go!!!!!! If you don’t already have completed teams, let me know!!!! Thanks, Kelly. Would love to have you on any of our water-well drilling teams. Our Lord shared the Truth with a woman beside a well of clean water. How fitting that you have chosen to do the same. Amen, Lanni. Seeing the folks in the village receive both clean water and the Living Water was a huge blessing.